A MAZON'S SIX-PAGE memos are famous. Executives must write one every year, laying out their business plan. Less well known is that these missives must always answer one question in particular: how are you planning to use machine learning? Responses like "not much" are, according to Amazon managers, discouraged. Machine learning is a form of artificial intelligence ( AI ) which mines data for patterns that can be used to make predictions. It took root at Amazon in 1999 when Jeff Wilke joined the firm. Mr. Wilke, who today is second-in-command to Jeff Bezos, set up a team of scientists to study Amazon's internal processes in order to improve their efficiency. He wove his boffins into business units, turning a cycle of self-assessment and improvement into the default pattern. Soon the cycle involved machine-learning algorithms; the first one recommended books that customers might like. As Mr Bezos's ambitions grew, so did the importance of automated insights. Consider Amazon's fulfillment centers. 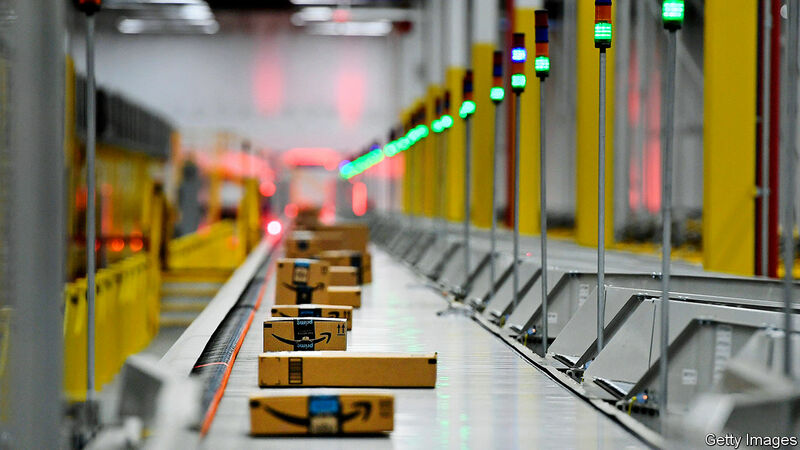 These vast warehouses, more than 100 in North America and 60-odd around the world, are the beating heart of its $ 207bn online-shopping business. They store and dispatch the Amazon sells goods. Inside one on the outskirts of Seattle, packages hurtle along conveyor belts at the speed of a moped. The noise is deafening-and the facility seemingly bereft of humans. Instead, inside a fenced-off area the size of a football field sits thousands of yellow, cuboid shelving units, each six feet (1.8 meters) tall. Amazon calls them pods. Hundreds of robots shuffle these in and out of neat rows, sliding beneath them and dragging them around. Toothpaste, books and socks are stacked in a manner that appears random to a human observer. Through the lens of the algorithms guiding the process, though, it all makes supreme sense. Human workers, or "associates" in company vernacular, man stations and gaps in the fence that surrounds this "robot field". Some pick items out of pods brought to them by a robot; others pack items into empty pods, to be whirred away and stored. Whenever they pick or place an item, they scan the product and the relevant shelf with a bar-code reader, so that the software can keep track. The man in charge of developing these algorithms is Brad Porter, Amazon's chief roboticist. His team is Mr Wilke's optimization squad for fulfillment centers. Mr Porter pays attention to "pod gaps", or the amount of time that the human workers have to wait before a robot drags a pod to their station. Fewer and shorter gaps mean less down time for the human worker, faster flow of goods through the warehouse, and ultimately speedier Amazon delivery to your doorstep. Mr. Porter's team is constantly experimenting with new optimisations, but rolls them out with caution. Traffic jams in the robot field can be hellish. Amazon Web Services ( AWS ) is the other piece of core infrastructure. It underpins Amazon's $ 26bn cloud-computing business, which allows companies to host websites and apps without servers of their own. AWS 's chief use of machine learning is to forecast demand for computation. Insufficient computing power as internet users flock to a customer's service can engender errors-and lost sales as users encounter error pages. "We can not say we're out of stock," says Andy Jassy, ​​ AWS 's boss. To ensure they never have to, Mr Jassy's team crunches customer data. Amazon can not see what is hosted on its servers, but it can monitor how much traffic each of its customers gets, how long the connections last and how solid they are. As in its fulfillment centers, these metadata feed machine-learning models which predict when and where AWS is going to see demand. One of AWS . And one of the main things other Amazon businesses want is predictions. Demand is so high that AWS has designed a new chip, called Inferentia, to handle these tasks. Mr Jassy says that Inferentia will save Amazon money on all the machine-learning tasks it needs to run in order to keep the lights on, as well as attracting customers to its cloud services. "We believe it can be at least an order-of-magnitude improvement in cost and efficiency," he says. The algorithms which recognize voices and understand human language in Alexa will be one big beneficiary. The firm's latest algorithmic venture is Amazon Go, a cashierless grocery. A bank of hundreds of cameras watches shoppers from above, converting visual data into a 3 D profile which is used to track hands and arms as they handle a product. The system sees which items shoppers pick up and bills them to their Amazon account when they leave the store. Dilip Kumar, Amazon Go's boss, stresses that the system is tracking the movements of shoppers' bodies. It is not using facial recognition to identify them and to link them with their Amazon account, he says. Instead, this is done by swiping a bar code at the door. The system ascribes the subsequent actions of that 3 D profile to the swiped Amazon account. It is an ode to machine learning, crunching data from hundreds of cameras to determine what a shopper takes. Try as he might, your correspondent could not fool the system and pilfer an item. AI body-tracking is also popping up inside fulfillment centers. The firm has a pilot project, internally called the "Nike Intent Detection" system, which does for fulfillment-center associates what Amazon Go does for shoppers: it tracks what they pick and place on shelves. The idea is to get rid of the hand-held bar-code reader. Such manual scanning takes time and is a bother for workers. Ideally they could place items on any shelf they like, while the system watches and keeps track. As ever, the goal is efficiency, maximizing the rate at which products flow. "It feels very natural to the associates," says Mr Porter. Amazon's careful approach to data collection has insulated it from some of the scrutiny that Facebook and Google have recently faced from governments. Amazon collects and processes customer data for the sole purpose of improving the experience of its customers. It does not operate in the gray area between satisfying users and customers. The two are often distinct: people get social media or search free of charge because advertisers pay Facebook and Google for access to users. For Amazon, they are mostly one and the same (though it is toying with ad sales). Where regulators do raise concerns is over Amazon's dominance in its core business of online shopping and cloud computing. This power has been built on machine learning. It shows no signs of waning.